Diomede Islands, from a U.S. government nautical chart. The purple vertical line is the international boundary. The Diomede Islands are located in the middle of the Bering Strait between mainland Alaska and Siberia, which borders the Chukchi Sea to the north and the Bering Sea to the south. 9.3 km (5.8 mi) to the southeast is Fairway Rock, which is generally not considered part of the Diomede Islands. Because they are separated by the International Date Line, Big Diomede is almost a day ahead of Little Diomede, but not completely; due to locally defined time zones, Big Diomede is only 21 hours ahead of Little Diomede (20 in summer; not 23 or 24 hours ahead, which is a common misconception). Because of this, the islands are sometimes called Tomorrow Island (Big Diomede) and Yesterday Island (Little Diomede). The islands are named for Saint Diomedes; Danish-Russian navigator Vitus Bering sighted the Diomede Islands on August 16 (O.S., August 27 N.S. ), 1728, the day on which the Russian Orthodox Church celebrates the memory of the saint. The islands are separated by an international border, which coincides with the International Date Line, about 2 km (1.2 mi) from each island, at 168°58'37"W. At their closest points, the two islands are about 3.8 km (2.4 mi) apart. The small habitation on Little Diomede Island is centered on the west side of the island at the village of Diomede. Big Diomede Island is the easternmost point of Russia. 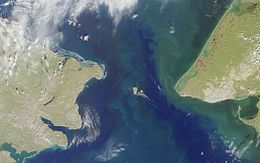 The Diomede Islands are often mentioned as likely intermediate stops for the hypothetical bridge or tunnel (Bering Strait crossing) spanning the Bering Strait. During winter, an ice bridge usually spans the distance between these two islands; therefore during such times it is theoretically possible (although not legal, since travel between the two islands is forbidden) to walk between the United States and Russia. The first European to reach the Bering Strait was the Russian explorer Semyon Dezhnev in 1648. He reported two islands whose natives had bone lip ornaments, but it is not certain that these were the Diomedes. Danish navigator Vitus Bering re-discovered the Diomede Islands while leading a Russian expedition on 16 August (O.S., 26 August N.S.) 1728, the day when the Russian Orthodox Church celebrates the memory of the martyr St. Diomede (hence, the name of the islands). In 1732, a Russian geodesist, Mikhail Gvozdev, determined longitude and latitude for the two islands. The text of the 1867 treaty between the United States and Russia which finalized the Alaska purchase uses the islands to designate the boundary between the two nations: The border separates "equidistantly Krusenstern Island, or Ignaluk, from Ratmanov Island, or Nunarbuk, and heads northward infinitely until it disappears completely in the Arctic Ocean." During the Cold War, that gap constituted the border between the United States and the Soviet Union, and became known as the "Ice Curtain". In 1987, however, Lynne Cox swam from one island to the other, and was congratulated by both Mikhail Gorbachev and Ronald Reagan for her feat. In summer 1995, British television actor and documentary presenter Michael Palin started his counterclockwise circumnavigation of the Pacific Rim, encompassing 18 different countries, on Little Diomede Island, as part of the BBC series Full Circle. He intended to set foot on it again at the end of his eight-month trek, but was unable to do so because of rough seas. Big Diomede Island was traditionally the easternmost landmass before the International Date Line, and the first landmass to ring in a new year, if using local solar time. When using official time, however, a large area in eastern Russia and New Zealand also share the same time zone. New Zealand also has Daylight Saving time in effect during late December, but Russia does not (see time in New Zealand and time in Russia). This became moot in 1995, however, when the International Date Line was moved to the east of Kiribati and that country's easternmost time zone (GMT+14) is now the world's earliest. The Soviet government relocated the indigenous population of Big Diomede Island to mainland Russia, and the island is now inhabited only by military units. Little Diomede has an Inupiat Inuit population of 170, entirely in the village site on the west side of the island, though the island as a whole comprises the City of Diomede. This village has a school, a post office and a store. Some Inuit residents are famous for their ivory carving. When weather permits, commercial air contact is maintained with the island as part of the US Government Essential Air Service Program. ^ "Two of the world`s largest countries, Russia and the United States, at their closest points are separated by 2.4 miles, but are 21 hours apart! Find out how ... | ePaper | DAWN.COM". epaper.dawn.com. Retrieved 2018-06-21. ^ "Could a Russia–US rail tunnel be built?". BBC News. 21 October 2011. ^ Smith, Martin. January 31, 1988. "The transcendent power of the solo athlete." Orange County Register, p. J1. ^ Tuchman, Gary (30 September 2008). "You CAN see Russia from here!". Anderson Cooper 360°. CNN. Retrieved 12 June 2011. ^ "Intent To Prepare a Draft Environmental Impact Statement for Navigation Improvements and Airport, Little Diomede Island, AK". U.S. Environmental Protection Agency. 29 October 2009. Archived from the original on 21 August 2009. Retrieved 12 June 2011. Wikimedia Commons has media related to Diomede Islands.